We had some downpour of blessed rain in the Land, as the Talmud says “The day of rain is greater than the day of the giving of the Torah!” As winter is coming forth, the students of Midreshet B’erot Bat Ayin warm themselves with Torah and Herbal teas from our garden. At this time I’m in the midst of planning my upcoming USA tour, and look forward to seeing old friends and alumnae. Please be in touch now if you would like the opportunity to host me in your community, so we will have time to ship my books, “Women at the Crossroads: A Woman’s Perspective on the Weekly Torah Portion” second edition! This time I plan to come before TubShevat so I can teach you “Mystical and Medicinal Properties of the Fruits of the Land” and lead your TubShevat Seder the B’erot Bat Ayin way! Yitzchak went out to meditate in the field towards the evening, and he lifted his eyes and saw, behold camels were coming (Bereishit, Chapter 24, Verse 63). Experiencing the solitude of the field and connecting with nature while watching the sheep is conducive to contemplation and communion with G-d. Our forefathers, Avraham, Yitzchak, and Ya’acov, were shepherds because this vocation offered perfect opportunity for meditative connection with Hashem. According to Rashi, when Yitzchak went out lasuach in the field, he was praying to Hashem. We learn this from the way the word lasuach is used in Tehillim, “A Prayer of the afflicted…when he fainted, and poured out his prayer (sicho) before Hashem”. Rashbam finds a parallel to the word lasuach in the word scrub (siach) mentioned in the story of creation. He explains that Yitzchak went out in the field to inspect his crop. Chizkuni synthesizes these two views, explaining, that Yitzchak went out of the Garden of Eden where he had been living for the last three years since his Akeida (near-sacrifice). He went out in order to (lasuach) plant trees, and to inspect his work, but also in order to (lasuach) converse/pray. Imagine Yitzchak walking between his plants (sichim) enjoying the beauty and Hashem’s blessings manifested in the majestic trees, as the sun is beginning to set behind the hills. While he inspects his plantings, he pours out his heart to Hashem in prayer, the prayer for his crop, shifts to the prayer for his spiritual crop – the offspring that he yearns for, shifting to the prayer from the deepest part of his soul, the prayer for his life-partner in serving Hashem and bringing forth children – the prayer for a wife. Immediately, as he completes his prayer – the mincha (afternoon) prayer that he established for all future generations, at this pivotal moment, “he lifted up his eyes, and saw, and, behold, there were camels coming,” bringing his soul-mate Rivka towards him. One of the earlier supports for Biblical hitbodedut (speaking with Hashem in the field), advocated so highly by Rabbi Nachman, is the Sforno who explains that when “Yitzchak went out lasuach” – he turned away from the main road, in order to pour out his prayer before Hashem in the quiet field where he wouldn’t be interrupted by other people. Sit comfortably in your chair, close your eyes and take deep breaths several times. Breathe deeply and feel completely relaxed in all of the limbs of the body. After a minute or two of relaxing breathing imagine that you are alone in the middle of a lush field. There are no other people, only trees, shrubs, herbs and grass. Enjoy looking at the lushness of the leaves, the textures of the branches, feel the crispy moist earth under your feet. Inhale the fresh smells of the leaves and grasses after the rain. Hear the rustling of the trees in the wind, and the song of the birds in their branches. Taste the tastes of clean fresh air as you inhale both from your nose and your mouth. Now imagine how all the beauty of nature that you behold inspires you to pour out your soul in the deepest prayer. As you pray, imagine how every blade of grass, every tree-branch, every bird of the field joins your prayer, imagine how the entire field becomes energized, sanctified and synchronized with your breath of prayer. Visualize the letters that spell out the word שָּׂדֶה (field) First the fiery sin ש with its three flames denoting shinui – change – as you enter the new energy field of prayer. Moving through the door of the letter dalet ד the – the poor –”that has nothing [d’leit] of her own.” Feel your own lowliness how you posses nothing of your own – how you are an empty vessel ready to receive Hashem’s blessings. As you move to visualizing the last letter of the word שָּׂדֶה the letter ה receive your gift from Hashem and manifest it into all the three garments of your soul. As you visualize the upper horizontal line of the ה imagine Hashem is purifying and filling your faculty of thought with His light, then visualize the right vertical line of the ה while imagine that your faculty of speech receives Divine illumination, finally as you visualize the unattached foot of the ה, imagine that all your actions become tuned up and synchronized with the Divine will. הַשָּׂדֶה Includes the sin ש and the dalet ד of Hashem’s name Shadai ש-ד-י, the two hehs ה add up to the final letter yud י (the numerical value of each heh is five adding up to the ten of the yud). Repeat this breathing ten times. The name Shadai refers to G-d’s power to make His Divinity conscious and accessible to every one of His creatures, regardless of their spiritual state. Imagine G-d’s power entering into every part of your life and being. 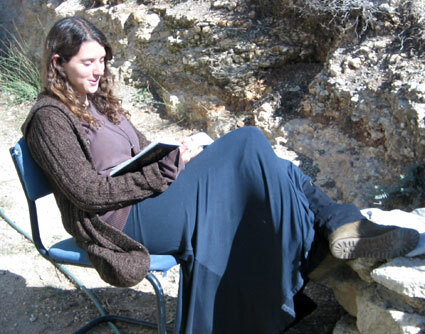 Imagine yourself at work; allow Hashem’s power to enter the field of your work. Imagine yourself in relationship to those close to you; allow Hashem’s power to enter the field of your relationships. Imagine yourself deeply in thought; allow Hashem’s power to enter the field of your contemplation. Shacharit was established by Avraham, when he arose in the morning to view the destruction that Hashem had brought upon Sodom. “Avraham got up early in the morning to the place where he had stood (amad) before Hashem.” We learn that the word “amad” refers to tefilah, because the words “va’yamod” and “v’yipalel” (standing and praying) are juxtaposed in another Torah verse. Ma’ariv was instituted by Ya’acov, when he was fleeing from Esav. “Va’yifga ba’makom” – He lighted upon the place…” – “pegiah” refers to tefilah. Rabbi Elly Krimsky explains that the three references to prayer by the avot correspond to three different motivations for prayer. Yitzchak’s prayer in the field corresponds to tefilah during ordinary day-to-day life - while working in the field (or in the office). The word sicha supports that Yitzchak’s tefilah represents day-to-day prayer as this word is often translated to mean everyday conversation. Yitzchak, thus, represents the ability to be intensely focused on Hashem in the midst of the daily humdrum of life. Rebbe Nachman of Breslau explains that the letter bet as a prefix, which usually means “in,” can also mean “with.” If so, we can understand that when Yitzchak went out to pray ba-sadeh, he was praying with the field! In other words, his prayer was so intense that nature itself felt compelled to join in. “No shrub of the field was yet in the earth, and no herb of the field had yet sprung up…” (Bereishit 2:5). Kol ha-kavod, really beautiful indeed!